Little Red Sled, a $2 3-D racing game from Imangi Studios, provides fun, though too-brief bursts. 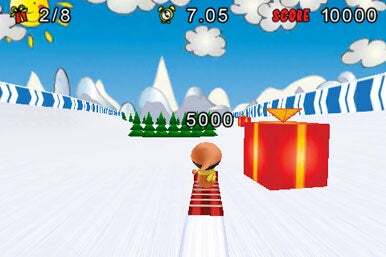 It’s All Downhill From Here: Little Red Sled gives you tasks like collecting gifts or performing tricks, but the game would be even better if it put more focusing on the racing. Each level has its own unique challenge. You might be tasked with collecting 10 gifts, or performing five tricks, or scoring at least 85,000 points. These challenges are fun, and they escalate in difficulty well. Successive levels add increasingly innovative obstacles to slow you down, too. I found, though, that succeeding in the challenges wasn’t as fun as the skiing itself. I want a mode where I can just ski along a path, collecting what I can along the way, in a given (and generous) time limit. The fun part is the skiing, and sometimes the challenges (and frequent breaks in between completing or retrying them) interrupted the fun too much for my tastes. Still, Little Red Sled looks good, and sports a stellar soundtrack with great effects. I’m optimistic that as levels are added, the game will evolve from good to great. Little Red Sled is compatible with any iPhone or iPod touch running the iPhone 2.1 software update.